I've done quite a lot of public speaking and I'm fascinated by the whole phenomenon and all the accompanying technology. ⊕ I've also organised various conferences of my own - a series called Interesting. There's a Walrus in my Fridge and It Won't Shut Up | This was from a conference in 2012 called Next. It was, sort of, the second part of this talk from 2011. If you'd like me to talk at your event please get in touch. If I am already speaking at your event you'll find a bio and headshots on the bio page. You might also want to read this blog post. I will not be part of all-male panels. 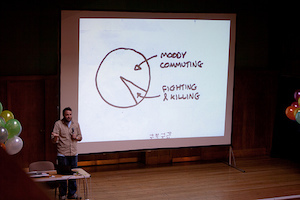 If you'd like thoughts about how to do presentations well I'm one of the contributors to Doing Presentations and I recommend all of its advice.